The winners’ discoveries in the 1970s, ‘80s and ‘90s have helped doctors diagnose a severe form of epilepsy and immune deficiency diseases in children. STOCKHOLM — Two Americans and a German-American won the Nobel Prize in medicine on Monday for discovering how key substances are transported within cells, a process involved in such important activities as brain cell communication and the release of insulin. The winners’ discoveries in the 1970s, â80s and â90s have helped doctors diagnose a severe form of epilepsy and immune deficiency diseases in children, Hansson said. In the future, scientists hope the research could lead to medicines against more common types of epilepsy, diabetes and other metabolism deficiencies, he added. “I called my lab manager and I told him to go buy a couple bottles of Champagne and expect to have a celebration with my lab,” he said. In the 1970s, Schekman discovered a set of genes that were required for vesicle transport, while Rothman revealed in the 1980s and 1990s how vesicles delivered their cargo to the right places. Also in the â90s, Sudhof identified the machinery that controls when vesicles release chemical messengers from one brain cell that let it communicate with another. “This is not an overnight thing. Most of it has been accomplished and developed over many years, if not decades,” Rothman told the AP. 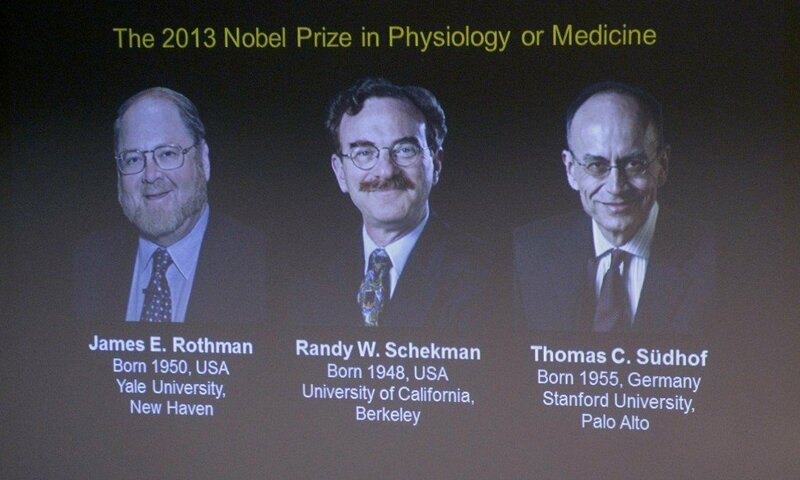 The medicine prize kicked off this year’s Nobel announcements. The awards in physics, chemistry, literature, peace and economics will be announced by other prize juries this week and next. Each prize is worth 8 million Swedish kronor ($1.2 million). Established by Swedish industrialist Alfred Nobel, the Nobel Prizes have been handed out by award committees in Stockholm and Oslo since 1901. The winners always receive their awards on Dec. 10, the anniversary of Nobel’s death in 1896. Last year’s Nobel medicine award went to Britain’s John Gurdon and Japan’s Shinya Yamanaka for their contributions to stem cell science.